You have enough background information. Meet the Speaker at the entrance. Ask if there is anything he/he requires. Show the speaker to his/her seat. Prepare your introduction and thanks beforehand. Write key words on a cue card. Repeating yourself - remember to use your notes. Why this subject subject for this audience? Why this subject for this audience at this time? 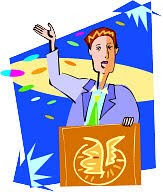 Unobtrusively guide speaker to audience members signalling to ask a question. Speak to the speaker and the audience.